I am ‘cat sitting’ while a friend of mine is in London for 10 days. This cat is a Rag Doll breed and is part Persian and Siamese (I think that is right). She has the most BEAUTIFUL blue eyes, but you cannot really see them here since I took a quick picture of her with my cell phone. 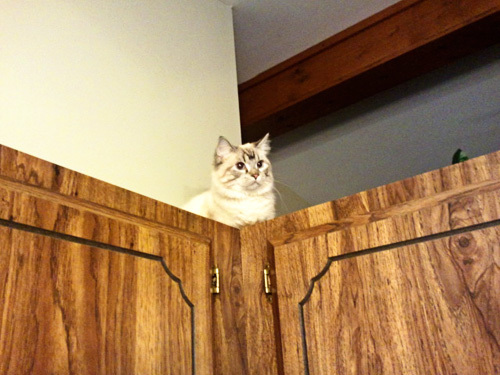 The kids and I came home this evening to find her up on top of my kitchen cabinets! I have vaulted ceilings in my house, so the cabinets are open on top. Nathan was in so much shock when he saw her up so high! Autumn was upset and begged me to get her down (I think she was worried about her). Of course, she came down on her own in time and I gave her a lecture about getting up there. Ha! Supposedly Siamese cats want to be at the highest point in the room. They are like little mountain goats!